Written, art and cover by Andrew Pepoy. Mix: one wacky girl with one tiny dinosaur; Result: Big Fun! Presenting three full-color, zany tales of Simone & Ajax: ³The Case of the Maltese Duck,² ³A Christmas Caper,² and ³Simone, Queen of the Jungle. Also includes extras by Pepoy. Intro by Mark Schultz. Written by Peter Milligan, art by Dexter Soy, cover by Chester Ocampo. Coinciding with the release Army of Two: The 40th Day, this new ongoing monthly series, written by comics veteran Peter Milligan, follows ex-Army Rangers Salem and Rios as they form their own Private Military Corporation: Trans World Operations. But the pair get more than they bargained for as they are unexpectedly caught in a brewing war between the Mexican Army, drug cartels, and The Maras‹one of the most powerful street gangs in Mexico! Written by Bill Willingham and Bill Williams, art by Brian Denham and David Messina, covers by Jenny Frison and Messina. Where has the "hero of L.A." gone? While Team Angel Investigations try to figure out how to handle the everyday demons, danger, and evil-doing on their own, Angel's whereabouts turn out to be part of a seriously sinister conspiracy. Plus: chapter of the Eddie Hope back-up by Williams and Messina. Written by Scott Tipton, art and cover by Elena Casagrande. IDW's series of adaptations of landmark Angel episodes continues with A Hole in the World, one of the series' most heartbreaking episodes! As Fred begins to succumb to a horrible curse, Angel and his crew frantically race to find a cure, and discover only treachery in their midst, in the form of a betrayal from one of their own. Written by Matt Venne, art and cover by Gordon Purcell. Guided by Brynna, a fearsome female Pict warrior, Marcus and his band of Roman deserters are in a desperate race against their pursuers to reach Antonine's Wall, and the freedom of its seaport. But this route will lead them directly into the mouth of Hell, and the many dangers it contains... including Gorgon-infested woods! Also, a betrayal is revealed! Written by Jack Briglio, art nad cover by Diego Jourdan. The all-ages adventures of NASCAR mascot Digger and his friends conclude here! After Grandpa spins a yarn about his bygone days of racing, Digger finally gets an opportunity to drive in a NASCAR race. But how? He's a tiny gopher! And will Lumpy ruin his chance to realize his dream? Written by Tony Lee, art by Al Davison, cover by Paul Grist and Davison. Part 1 of the two-part "Tessaract," featuring the return of artist Al Davison. When a 5th-dimensional spacecraft crashes into and through the TARDIS, it's up to the Doctor and his two new friends to stabilize the console room and stop both ships from imploding! But the console room is missing, and the other ship is filled with an alien race that wants the Doctor dead! Written by Peter David, art and cover by JK Woodward. In this all new collection, the Fallen Angel finds herself pitted against a special guest-star... Joss Whedon's Illyria. On a mission to reclaim three objects of power, which she hopes will restore her former glory, Illyria must also dispatch of another "fallen" godling... namely Liandra, the Fallen Angel, Magistrate, and protector of Bete Noire. Who will win in this ultimate battle of wills, the fallen demon god, or the fallen angel? Written by Steve Niles, art and cover by Bernie Wrightson. The Ghoul arrives in Los Angeles and quickly learns that there's more to Hollywood than glitz and glamour -- there are also demons invading Griffith Park and a cop named Klimpt, who is convinced an aging starlet is a blood-sucking freak of her own creation. It's the Ghoul versus Demons in this knockdown, drag-out melee of monstrous behemoths! Written by Chuck Dixon, art by Robert Atkins, covers by Atkins and David Williams. Snake Eyes and the Hard Master reunite as the JOE's silent bringer of death seeks the tutelage of his mentor. And a Cobra operative invades a college campus with deadly results for the Joes. The action builds as the M.A.S.S. Device moves closer to a reality! Written by Larry Hama, art by Frank Springer and Rod Whigham, cover by Andrea DiVito. Collecting the most incriminating moment of G.I. Joe's Baroness, this volume focuses on the Baroness, Cobra's most seductively evil intelligence officer and lieutenant to Cobra Commander himself. Written by Mike Costa and Christos N. Gage, art by Antonio Fuso, covers by Fuso and Howard Chaykin. Chuckles is the only man alive to have successfully infiltrated Cobra... and he's M.I.A. Has he been killed? Defected? Gone rogue to fight a one-man war against the enemy? None of these alternatives are acceptable to General Hawk. He wants Chuckles back with G.I. Joe, so he's sending a new Joe to retrieve him. But what she finds may be worse than anyone could have imagined... Also, get a deeper look inside Cobra than ever before, as Tomax, Xzamot and Erika continue to feel the effects of the previous mini-series, and several Cobra operatives are introduced for the first time in an IDW book! Written by J.T. Krul, art by Klau Scherwinski, covers by Scherwinski and Tom Feister. When Army Ranger Wayne Sneeden washes ashore in Guatemala with no memory of who he is, how he got there, or who shot him, putting together the pieces of his past shows him a future he never imagined‹and a new name to go with it: Beach Head! Written by Ray Park and Kevin VanHook, art and cover by Lee Ferguson. Having returned to the village where he trained with the Arashikage Clan, Snake Eyes uncovers the true identity of the murderer who had stolen his identity! Now Snake Eyes must take the battle to holy ground as he confronts a demon from his past -- and watches the world around him go up in flames! Written by John Ostrander, art and cover by Timothy Truman. GrimJack is in a race to save Blacjac and Bob from the Manx Cat. The problem is... everyone who falls asleep becomes an unwilling Night Terrorist in the Manx Cat's army! Bullets, blood, bikes, bombastic babes... and the St. John Knives! What more can you want in a stunning conclusion? Written by Ted Adams, art by Gabriel Rodriguez, Ashley Wood, Ben Templesmith and more. Now available in a softcover edition, this collection includes every cover done for an IDW book up through December 2008 (That's more than 2,100!). Artists include: Clive Barker, Tim Bradstreet, John Byrne, J. Scott Campbell, John Cassaday, Richard Corben, Kieron Dwyer, Tommy Lee Edwards, Don Figueroa, Alex Garner, Mike Grell, Tony Harris, Dave Johnson, Sam Kieth, Igor Kordey, Ted McKeever, David Messina, Alex Milne, Scott Morse, Paul Pope, Gabriel Rodriguez, Richard Sala, Eric Shanower, Bill Sienkiewicz, Ken Steacy, Ben Templesmith, Billy Tucci, Ashley Wood, JK Woodward, Bernie Wrightson and many more. Written by Scott Lodbell, art and cover by Casey Maloney. Love may be blind, but it is certainly not deaf. Which is why the Music Box is able to so thoroughly complicate the life of a cheating husband and his mistress. From the mind of Jennifer Love Hewitt comes another thriller. Written, art and cover by Mike Grell. Jon Sable, kidnapped! As his captors torture him, we join Jon on a journey though through the darkest caverns of his soul. Discover the identity of the Maguffin Diamond thief -- as New York City gets set up for Nuclear Winter! Written and art by Jack Kent. 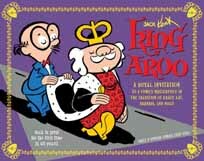 The Library of American Comics proudly presents a long-neglected classic -- King Aroo! Lauded by critics in the pantheon of great strips such as Krazy Kat, Pogo, and Barnaby, Jack Kent's brilliantly conceived world brought smiles to young and old alike with its fanciful array of clever puns, visual humor, and good old slapstick. Includes a text feature by Bruce Canwell, and an introduction by Sergio Aragones. Volume One celebrates the strip's 60th anniversary by presenting every daily and Sunday strip from the beginning in 1950 through 1952. Written and art by George Herriman. Krazy Kat's most surreal adventures were the famed "Tiger Tea" sequence where Krazy Kat imbibed a psychedelia-inducing substance. This is George Herriman at his best in the only full-length Krazy Kat adventure story of his career presented in the same era as Terry and the Pirates and Captain Easy. 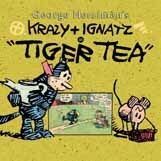 Krazy & Ignatz in Tiger Tea showcases a rare photo of Herriman sporting a Mexican sombrero and smoking a funny looking cigarette, a perfect addition to this fun, classic trip down memory lane. 122 pages, black and white, $12.99. Written, art and cover by Eric Shanower. In the marvelous Land of Oz, magic is always around the next corner. Dorothy, the Scarecrow and their many friends can't stop plunging into one adventure after another. Wonder and magic abound in this collection of "The Enchanted Apple of Oz" and "The Ice King of Oz" by award-winning cartoonist Eric Shanower. Written by Joe Hill, art and cover by Gabriel Rodriguez. Dodge takes possession of the crown of shadows, and darkness falls upon Keyhouse... with a vengeance. Written, art and cover by Rick Berry. 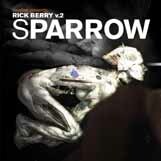 Rick Berry started in underground comics at age 17, expanding into popular culture with art for Marvel and DC comics; major book and gaming publishers; television and feature film (including being Keanu Reeves' cyber stunt double in Johnny Mnemonic). In 1984, raiding MIT's Media Arts and Mass College of Art's digital labs, Berry created the world's first digital cover for a novel, William Gibson's Neuromancer. Authors Frank M. Robinson, Stephen King, Peter Straub, and Neil Gaiman have commissioned work, and Berry's art continues to win awards and appear in print. Written by Scott Tipton and David Tipton, art by Federica Manfredi, cover by David Messina. Introducing a brand-new series focusing on some of the most famous Captains in Starfleet history! In the debut issue, Captain Hikaru Sulu, still new to the command of the U.S.S. Excelsior, finds himself once again face to face with one of the Federation's most dangerous and mysterious adversaries -- the Tholians! From the creative team behind Spock: Reflections! Written by Scott Tipton and David Tipton, art by Fabio Mantovani, covers by Sharp Brothers and David Messina. Deep Space Nine teeters on the brink of anarchy as swarms of treasure-hunters and mercenaries continue to flood the station. Major Kira and Constable Odo are on the case, and the investigation leads to a not-unexpected destination: Quark's Bar! Written by Zander Cannon, art by Javier Aranda, cover by Joe Corroney. With Worf captured and under threat of execution, Geordi, Troi, and Dr. Crusher race to get information that will exonerate him. Picard and Riker negotiate with Worf's captors, but the paranoid warlords continue to regard all outsiders as a threat, and launch a military attack on the ship under the Enterprise's protection. Written by Scott Tipton and David Tipton, art by David Messina and Frederica Manfredi, cover by Messina. In the follow-up collection to the smash hit Stark Trek: Countdown movie prequel, we discover what could drive a man to abandon all he knows and go to live with the Federations sworn enemy. Discover his real motivations and how he looks back at what brought him to this stranger place in his life. Written by Elaine Lee, art by Michael Wm. Kaluta and Charles Vess, cover by Kaluta. Molly joins a band of female-fighters and is leading an action to deface a Temple of Beauty franchise in the XYchromo Zone. She's arrested and sent to prison, where she's tricked into escaping by her cellmate, Murphy, secretly in league with Molly's little sister, who now calls herself Verloona. Betrayed, Molly is dropped onto the abandoned penal colony, Omega 6... for life! Written by Mike Costa, art by Don Figueroa, covers by Figueroa and Andrew Wildman. Hot Rod's desire to get off-planet leads to some desperate measures, Optimus Prime and Spike sit down for an unpleasant conversation, and a new arrival to the Autobot camp comes at their most vulnerable time possible. Costa and Figueroa continue to make history, bringing the Autobot to their (almost) darkest hour. Written by Simon Furman, Mike Costa, Shane McCarthy, Andy Schmidt, Nick Roche, Denton J. Tipton, Zander Canon, art by Don Figueroa, Chee Yang Ong, Emiliano Santalucia, Andrew Griffith, Casey Coller, Nick Roche and Guido Guidi, cover by Trevor Hutchinson. It ends here. All loose ends are laid to rest in this collection that ends the All Hail Megatron saga and sets the stage for big things to come for the Transformers! Written by Marty Isenberg, art by various. The Season 2 adventures of the Transformers in New Detroit come to a dramatic conclusion in episodes "A Bridge Too Close" parts one and two. Featuring Optimus Prime, Bumblebee, Ratchet, Megatron, Blitzwing and more, the Transformers Animated series puts new TF action in your pocket! Written by Zander Cannon, art by Chee, cover by Chee and Guido Guidi. "Things Fall Apart," Part 2: Bumblebee's human-allied Skywatch team tracks down their latest target: the Autobot Blurr. With this forced betrayal, the team's morale takes a deep plunge until Bumblebee and Wheeljack devise a dangerous mission to free them all from the kill-switches that compel them to obey Col. Horiuchi's commands. Written by Nick Roche, art by Roche, covers by Roche and Trevor Hutchison. The Autobot special ops crew, The Wreckers, are sent to investigate Garrus-9, a prison that fell to the Decepticons three years ago with no communication in or out since. Who's really behind the prison siege, and what dark secret awaits Springer there? Written by Chris Mowry, art by Alex Milne, covers by Carlos Magno and Milne. Setting out in search of Optimus Prime and the Autobots, Arcee is captured by the vicious Thundercracker. And what better punishment for this Autobot warrior than being the catalyst for a new squad of Decepticons? Arcee must learn that a good leader conquers all, especially in war. Written by El Torres, art and cover by Gabriel Hernandez. Meet Chris Luna, a cheap private eye with a client list of the dearly departed. Chris has the unique ability to sometimes pierce through The Veil between our realm and the unknown beyond. Unfortunately, it doesn't really pay the rent. Now Chris is broke and has to return home to Maine... and face the darkness that now lurks beneath the surface of her quiet hometown. Includes bonus materials and an Ashley Wood cover gallery. Written by Chris Ryall, art by Alan Robinson, covers by Robinson and Joe Corroney. Bat Boy! PhD Ape! Manigator! UFO Alien! Ed Anger, the columnist who sits to the far right of the far right! These and many other tabloid newspaper staples from the Weekly World News are featured in their first-ever miniseries. And they've got it rough from the start, as Chaos Cloud appears in "The Irredemption of Ed Anger, Part 1." Also features original articles from the Weekly World News as a back-up feature! 32 pages, $3.99. (Black and white newspaper edition, $3.99). Written by Kurt Busiek, art and cover by David Wenzel. A magical story of redemption! The Wizard's Tale is the story of the aged Bafflerog Rumplewhisker and his young companion, Muddle, the woodcutter's son, as they embark on a quest to retrieve the magical Book of Worse -- a tome that will ensure the land of Ever-Night remains as it is, a dark and gloomy realm of evil. But old Rumplewhisker's heart slowly warms on their journey, and a chance to restore a semblance of goodness to Ever-Night is possible -- If he and his young charge can dare face the challenges ahead. Written by Megan E. Bryant, art and cover by Nancy Gayle Carson. "Princess Valentine wakes with the sun on her favorite day of the year. A day for kisses, a day for hugs -- Valentine's Day is here!" Princess Valentine has so much to do to get ready for the Valentine Ball! Come along on a delightful adventure with Princess Valentine as she celebrates her favorite day of the year.